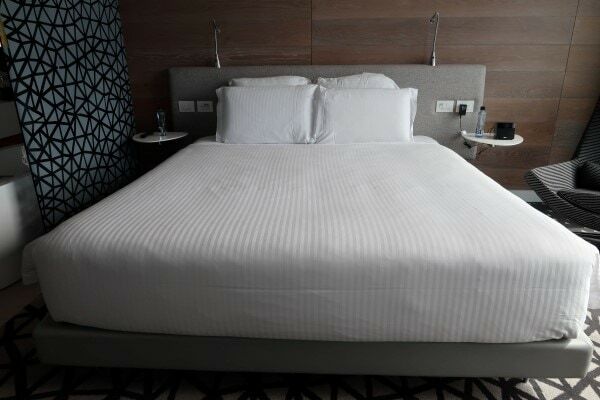 Accor’s Pullman Hotel is the first 5 star hotel to service Sydney Airport. 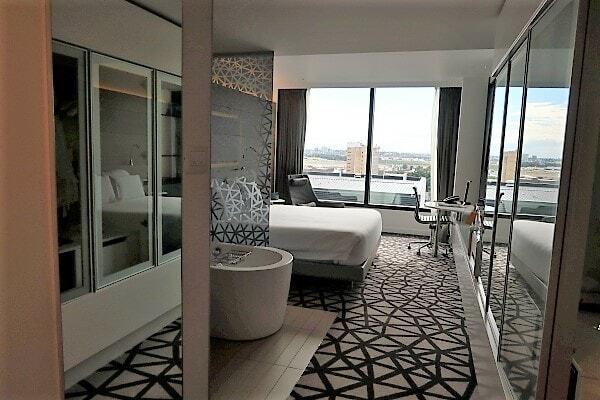 The 229 room property is one of a number of new Australian hotels opened in recent times by Accor. In a sea of tired offerings, the new Pullman Sydney Airport has all the facilities you’d expect from an internationally branded 5 star hotel. 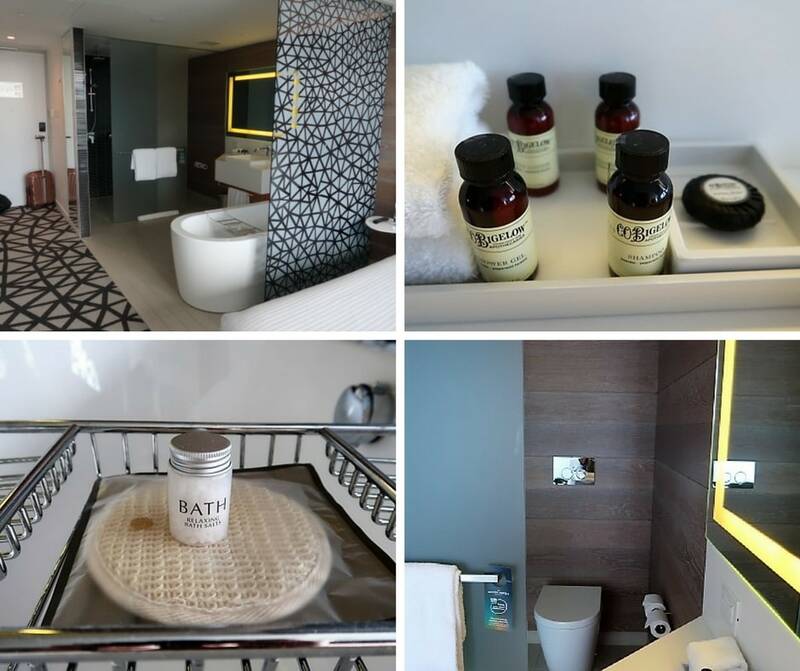 Rooms feature fully open plan bathrooms - not ideal for travelling with business colleagues. 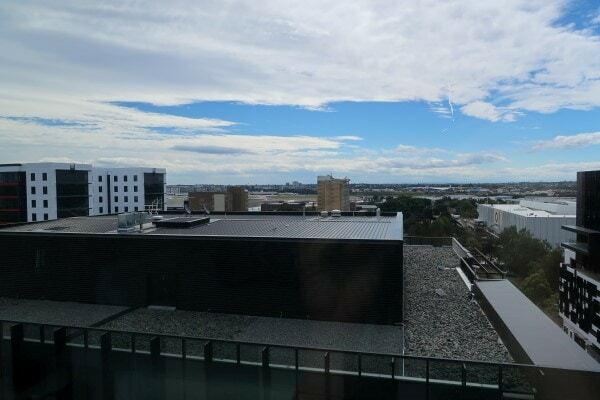 Located in a new business park, the Pullman Sydney Airport is a long walk from the terminal and you’ll make taxi drivers weep with the low fare. As a Platinum member, I frequently stay at high end Accor properties. Where Accor’s other five star chain, Sofitel, focuses on luxury French chic, the Pullman brand aims to provide upscale, modern and business friendly accommodation. Having embarked on a Qantas status run in early January, I was in need for a Sydney Airport hotel before departing for Noumea early the next morning. With the Pullman Sydney Airport having received a number of positive reviews, I booked in, keen to see if it would live up to the hype. A 3 pm arrival meant that I had plenty of time to check out the hotel before my flight to Noumea the next morning. Exiting the Sydney Airport Domestic terminal, I flagged a cab for the 1.5 km trip to the hotel, which took less than ten minutes. A generous tip was provided to the cab driver to apologise for the short fare. As I approached, it was clear the Pullman Sydney Airport isn’t your typical, tired airport hotel. Entering the lobby, you’ll find the check in counter to your left and Restaurant Atelier to your right. Bright purple lighting and a palate of dark hues greet you and you could be forgiven for thinking you’d just walked into a nightclub. A mezzanine level houses various conference rooms and the Executive Lounge (accessible to guests staying in Executive rooms and Accor Platinum members). 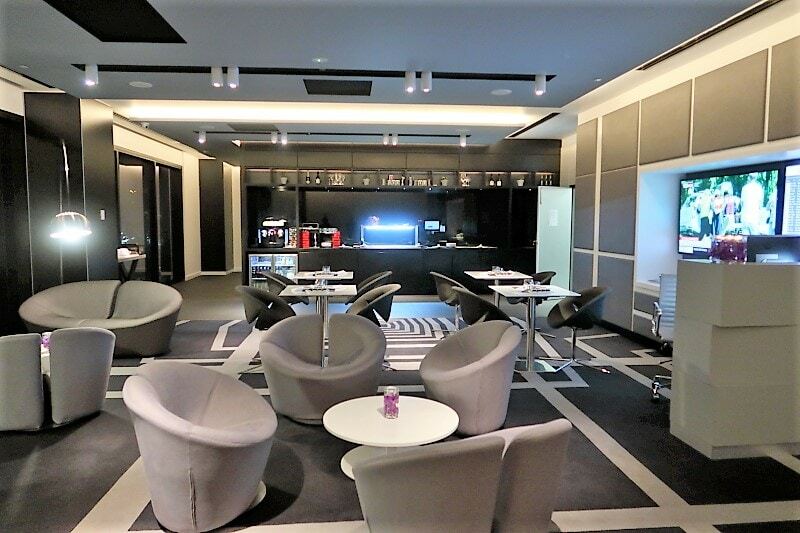 A second public sitting area which includes a Nespresso station is provided for guests. 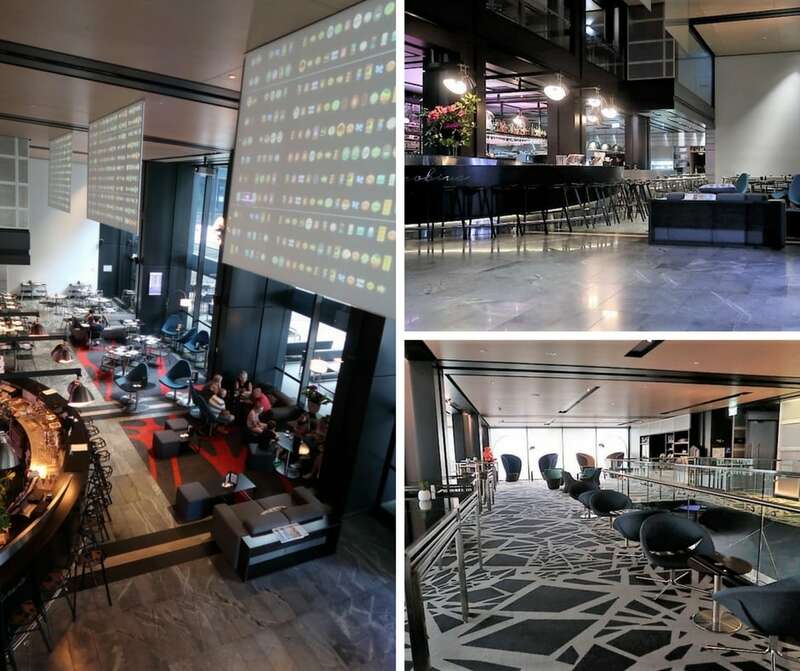 Check in at the Pullman Sydney Airport was completed smoothly, and I was provided a number of amenities as an Accor Platinum guest. These included a welcome drink, upgrade to the next room category, the offer of a late check out, access to the Executive Lounge and a welcome gift waiting for me in my room. Accor’s treatment of Platinum level status used to be quite patchy, with benefits such as room upgrades and welcome gifts applied inconsistently, or begrudgingly, depending on the property. 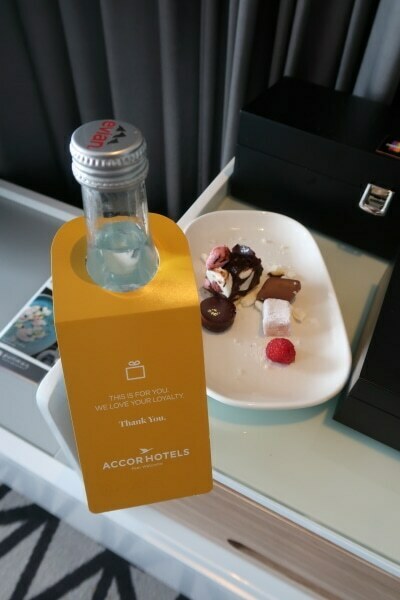 However, Accor overhauled its loyalty scheme a couple of years back, and since that time, I’ve been impressed at how consistently the benefits are applied. If you’re interested in obtaining elite Accor status, you can read about how to instantly fast track your membership level to Gold here. My room was located on level 11, one of the higher floors. As I made my way out of the lift, I noticed that the carpet was laid out as an airport runway. A clever touch. As an Accor Platinum member, I’d been upgraded to a deluxe corner room. The room was bright and airy, with a range of smart, modern, finishes I’ve come to expect from a Pullman property. A large bank of corner windows provided views over the surrounding buildings, with a glimpse to the tarmac in the distance – great for plane spotters. An Accor Platinum welcome gift was waiting for me in the room. It consisted of a bottle of Evian water and a small plate of petit fours. The king size bed looked incredibly comfortable and inviting, and I was pleased to find a range of hard and soft pillows available for use, not just listed in a pillow menu. Complimentary water was placed on the night stands. I was surprised to find that the bathroom was almost completely open plan. While this was fine for me as a solo traveller, the set up isn’t likely to be suitable if you happen to be sharing a room with a work colleague. The open area portion of the bathroom houses a deep soaking bath and a double vanity, while thin frosted sliding doors allow you to close off the toilet and shower areas. As is standard in Pullman properties, CO Bigelow toiletries were provided. 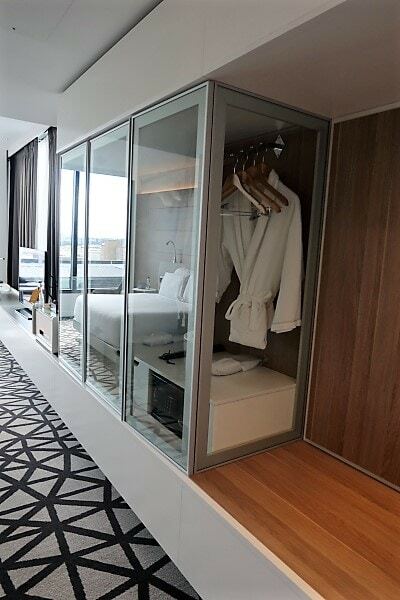 Across the opposite wall, a transparent glass wardrobe housed robes and a minibar and carried on the open plan theme. A complimentary Nespresso coffee maker was provided, with a generous range of pods available. 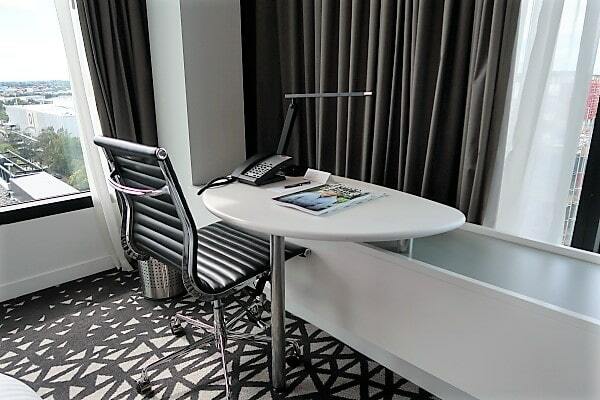 Along from the wardrobe, a smart but small desk and an Eames office chair provided a compact facility for working on the go. The Pullman Sydney Airport Executive Lounge is located on the mezzanine floor along with a number of meeting rooms. Complimentary canapes and evening drinks are served daily from 5 pm to 7 pm. Breakfast is served from 6.30 am until 10 am, with coffee and basic refreshments on offer throughout the day. As I was heading into the city to meet friends for dinner, I sadly missed out on the evening canapes served at the Pullman Sydney Airport Executive Lounge. An early flight departure the next morning also meant that I wasn’t able to partake in breakfast. I paid the lounge a quick visit before I departed in the morning. It’s a small but smart space, and I look forward to enjoying it next time I visit. The Pullman Sydney Airport is a smart, new addition in a sea of tired airport properties. It has all the facilities you’d expect from an internationally branded 5 star hotel, including an Executive Lounge. While the location makes it difficult to reach on foot, it’s far enough away from the terminal to get out and about. With the Mascot train station within easy reach, you could easily spend an evening bar hopping in Sydney rather than being confined to the limitations of dining at an Airport hotel. The furnishing and decor is fresh, modern and welcoming. However open plan approach to bathrooms mean the rooms are probably unsuitable for sharing with colleagues. 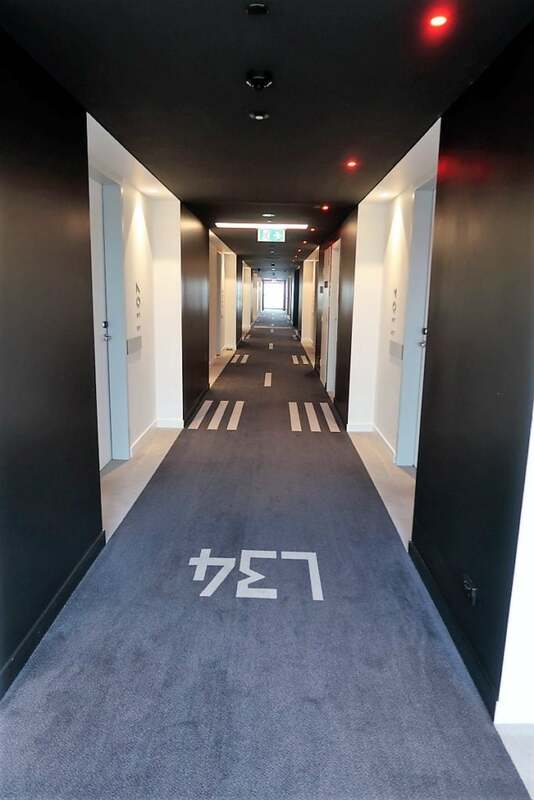 Rates at this hotel are frequently on special, meaning that you can often book a room at this five star property cheaper than other less luxurious airport hotels. And if you hold elite Accor status, you can benefit from valuable perks such as a free welcome drink, welcome gift, upgrade and more.